What I believe about cooking, food, and friends. From the beginning I have always been creative. Music, drawing, writing, designing and now cooking have all consumed me in some form or another. But the cooking seems to ignite all my talents. I see the deep significance of nourishing others as a way to heal wounds, answer all questions, and show love to others. And I believe fully that food is the metaphor for all of our experiences. Cooking also allows me to entertain and connect with those around me. It helps me learn about people and to awaken their palates with something new and memorable. For me heaven would be a giant table of friends and I am cooking. Laughing, sipping, devouring and even comparing a few celestial recipes is my kind of forever! During the day I spend my time as an entrepreneur, managing my own Creative Design Firm, C and Company. As a Brand Therapist and Designer I have worked as a Graphic Artist, Writer and Consultant for over 20 years. But in the evening and at any moment I need sanctuary, I will probably tell you that I just feel like cooking. Come. Knock on my door. I will invite you in, give you something to eat, and we will cook, learn, and laugh together. Yes, that's me. The squirt in the middle, pausing to consume my milk before our culinary adventure gets started. Sure the apron is handmade, and obviously designed to show off my fabulous shoulders. Yet, there is more to this photo than ill fitting accoutrements, or glass milk bottles; charming though they may be. 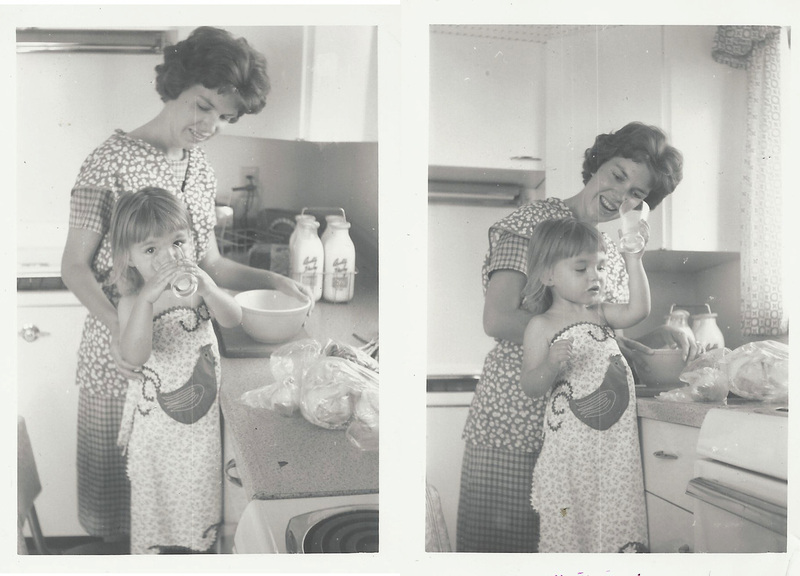 The most important part of this photo is my mom, who is front and center in my stove-side memories, and sporting a really cute apron of her own. I feature her here because she is the one that helped me find joy in the kitchen, and in setting a table of love for others. Thank you, Mom!